The time and date will be displayed in alphanumeric on LCD. The communication requires only two pins on the microcontroller bord: A4 and A5. Contrast Adjust : has a built in potentiometer for contrast adjustment. You should see the LCD light up by starting, if it dose not happened, you may want to turn down the contrast of the LCD. LCD has 2 lines, 16 character in each line and each character have 5-pixel in width and 8-pixel in height. The LCD supports up to 8 custom characters numbered from 0 to 7. 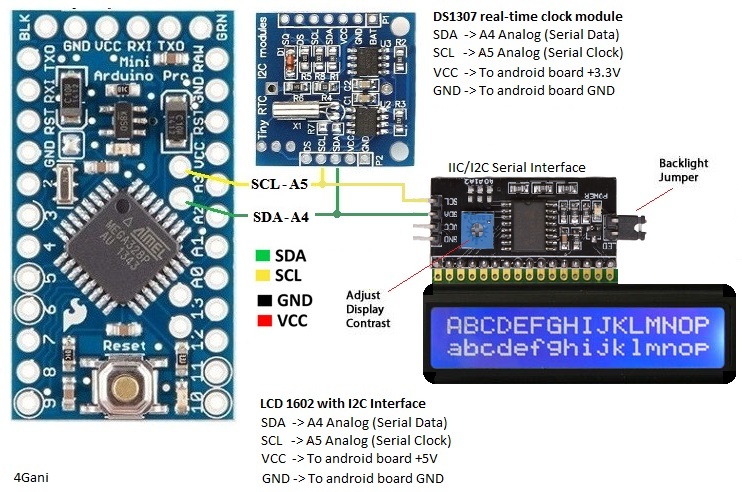 The DS1307 Real time use also I2C Protocol to communicate with arduino. Each device on the I2C bus has its own unique address. The LCD display used here has address 0x27. To drive LCD I’m using the LiquidCrystal_I2C library, which seems to be commonly used.